This is our coverage of Calderdale, historically largely part of the West Riding of Yorkshire, though Todmorden was divided between Yorkshire and Lancashire. The Metropolitan Borough of Calderdale was created in 1974 with the amalgamation of the County Borough of Halifax, Brighouse Borough, Todmorden Borough, Hebdon Royd Urban District (formed in 1937 through the merger of Hebden Bridge and Mytholmroyd UDs), Ripponden Urban District, Sowerby Bridge Urban District, Hepton Rural District, and the Shelf part of Queensbury & Shelf Urban District. 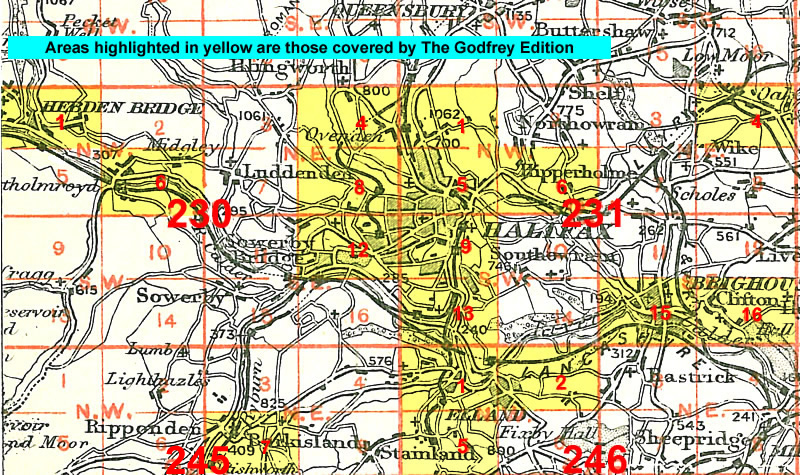 At the same time it became part of the new West Yorkshire Metropolitan County. Since 1986 it has been a unitary authority.